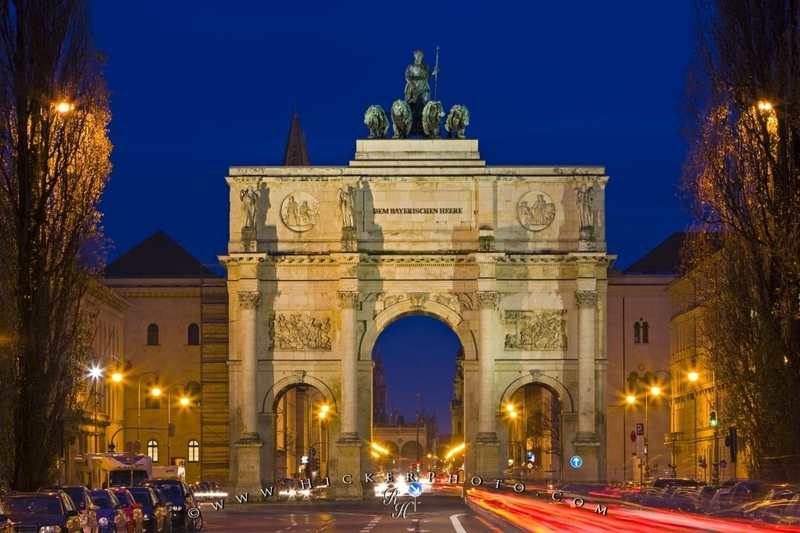 The Siegestor, also known as the Victory Gate, is a historic landmark situated in a busy area in Munich Germany as can be seen with the flowing traffic. The gate was built in 1852 and sustained some damage during bombing in WWII. The Siegestor is called the Victory Gate in English and is a historic landmark located in the Schwabing district in the City of Muenchen, or Munich as it is known in English. This landmark is situated along a busy road. As night has fallen on the city, the Siegestor is lit up with lights and even the quadriga on the top is lit so that it is clearly visible. The Siegestor was first commissioned by King Ludwig I of Bavaria in 1843, and was completed in 1852. It was built and named the Victory Gate to celebrate the win of Bavarian army in the Napoleonic War. It is built in the same style as the Arc de Triomphe in Paris and the Arch of Constantine in Rome. Photo of the Siegestor, an historic landmark situated in the Schwabing district of Munich, Germany. Pictures from photo gallery "Munich Pictures"
This picture is part of the photo album "Munich Pictures" - there are more beautiful images waiting for you. The Siegestor (Victory Gate) with traffic flowing around it at dusk in the Schwabing district in the City of Muenchen (Munich), Bavaria, Germany, Europe. I photographed this photo with the digital SLR camera model Canon EOS-1Ds Mark III, aperture of f/20.0, exposure time of 15/1 sec. on ISO 50, as always I used a original Canon Lens, the focus lenght for this picture was 145mm.